Though currently on tenterhooks, The Libertines have managed to release a single to mark the end of a blazin' summer and who knows, possibly even their short-lived career. "Don't Look Back Into The Sun" is a magical song that only shows this band has their best work in them if they can keep it together. Produced by former Suede axeman Bernard Butler, this two-part single is their best effort since their debut single "What A Waster". Containing an upbeat pace and an infectious chorus complete with the dumpster-style guitars, it's a true contender for song of the summer. 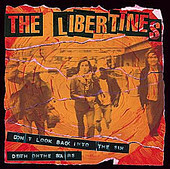 And to make it worth the price of admission, included as bonus tracks over the two CDs is a re-recorded version of "Death On The Stairs" (included as a double A-side on CD1), that includes some newly added and much welcome backing vocals, as well as a demo of "Tell The King", which betters the album version, with Pete Doherty and Carl Barat opting to make it a duet. "Skint And Minted", a self-produced demo, seems to sum up the band's story to a tee, adding uncharacteristic JAMC feedback to balance the elegantly dirty quality of this hidden gem. "Mockingbird" proves to be the only disappointment. An outtake from the album sessions with Mick Jones, it's a tad too blues for the boys, wandering off aimlessly instead.